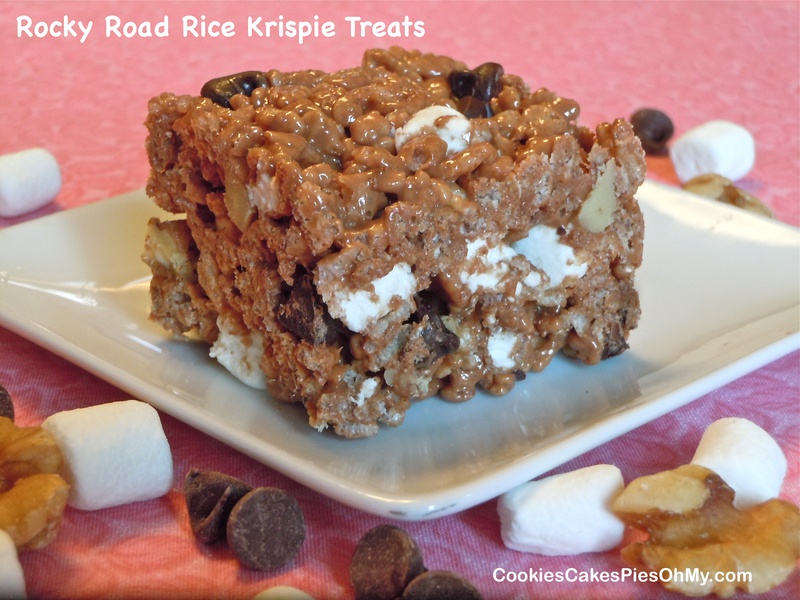 I don’t think I ate any meals today…just these Rocky Road Rice Krispie Treats. Addicting! Put mini marshmallows and chocolate chips in plastic bag and freeze for at least one hour. Spray a 13″x9″ pan with nonstick spray. Put Rice Krispies and walnuts in large bowl, set aside. Melt butter in microwave in large bowl. Add mini marshmallows, stir to coat and microwave 30 seconds at a time, stirring in between, until melted. Stir in the 1/2 cup chocolate chips, until melted. Pour over Rice Krispies/walnuts and quickly stir to coat. Add frozen marshmallows and chocolate chips and stir. Dump into prepared pan and press evenly into pan (I spray a clean hand and press). Let set up, eat!